The above text is copied directly from the text of Measure LC. 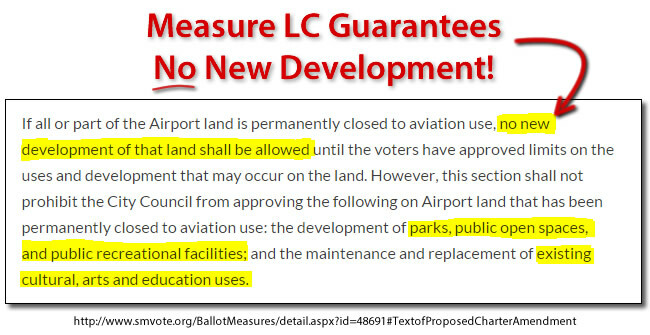 It clearly states that “if all or part of the Airport land is permanently closed to aviation use, no new development of that land shall be allowed” without additional voter approval. The only exception would be the development of “parks, public open spaces, and public recreational facilities.” What a great deal this is! Measure LC would be a huge win for our community. If the airport ever closes, it would prevent the City Council and developers from doing anything with the land, except for turning it into public parks. Measure LC also allows for the “maintenance and replacement of existing cultural, arts, and education uses.” It does not allow for any expansion without additional voter approval. That’s it. No funny business, no cryptic language. Vote YES on Measure LC.